Mr. Lim Byung-Keun (2nd from right) of S. Korea's LS Cable & System poses with Mr. Edwin Huisman (left) of Van Oord Company, CEO Peter Raijer (2nd from left), president of LGCE Quics. 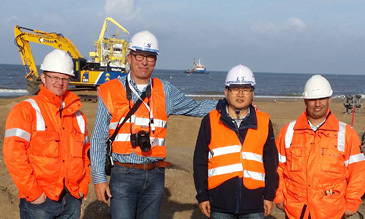 South Korean industrial giant LS Cable & System and Dutch company van Oord have begun the installation of a new offshore power cable connecting Noordwijk beach and a new wind farm in Luchterduinen in the Netherlands. 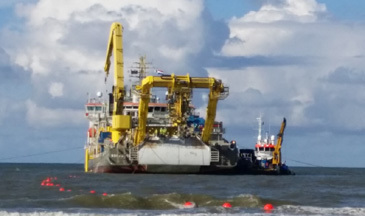 Mid October saw the start of the crucial phase of cable laying and jointing in the submarine works for the new offshore wind farm 23 kilometres off the Dutch north coast. A huge submarine vessel landed at the beach carrying the export power cable that will be used to transport the 129 megawatts generated by the 43 turbine wind farm to the shore. 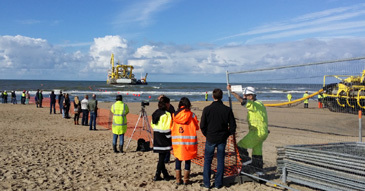 The cable will then be buried in the sea bed over a length of approximately 25 kilometres from the beach to the offshore substation at the wind farm . It is a project commissioned by wind farm developer Eneco (one of the largest producers and suppliers of natural gas, electricity and heat in the Netherlands) and the main contractor is the Dutch company, van Oord. 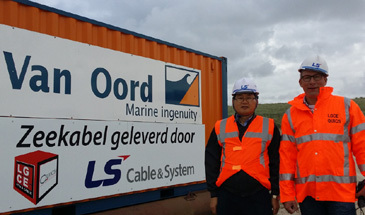 Korean firm LS Cable have provided the underwater cable in conjunction with their Dutch agent LGCE-Quics and carried out the joint work for each cable end. It is expected that the installation works on the beach will be finished by the beginning of November. Early next year the wind turbines will be installed in the Dutch North Sea. By the end of 2015, this wind farm will provide electricity to around 150,000 households. Mr. Lim Byung-Keun (3rd from right) of S. Korea's LS Cable & System poses with his international fellow workers. Based in South Korea LS Cable & System (LS C&S) is an industrial giant with global operations and one of the biggest cable manufacturers in the world. LS Cable products comprise power and telecommunication cables and systems, as well as integrated modules and other related industrial materials. 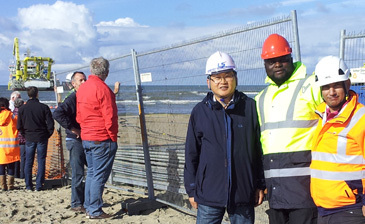 Mr. Lim Byung-Keun (left) of S. Korea's LS Cable & System poses with CEO Peter Raijer, president of LGCE Quics. It furthermore provides engineering services, installation and commissioning of high voltage and extra high voltage landlines as well as turnkey submarine cabling project execution. 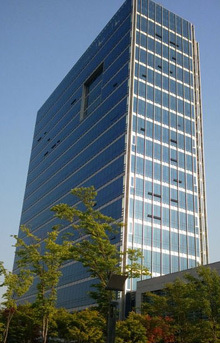 LS C&S has its headquarters at the LS Tower in Anyang and nine domestic factories of which six are located in Gumi, two in Donghae and one in Anyang. Additionally LS C&S has nine other factories in China, Malaysia, Vietnam and India. Furthermore, LS C&S owns magnet wire and data cable manufacturer Superior Essex with 24 factories spread over North America, Europe and China. LS C&S sales subsidiaries and branches overseas are located in Asia, the Middle East, Africa, Europe and in the Americas. LS C&S also owns JS Cable, Gaeon Cable, Pountek, Global Cable Incorporated, Kospace and Alutek, all of them with factories in South Korea. Lim Byung-Keun serves as director for The Seoul Times. He is one of the founding members of The Seoul Times. A native of Seoul Lim served in many cities around the world including Israel, Taiwan, and Vietnam, working for LS Cable & System Ltd. He graduated from Kyungbock High School and Dongguk University in Seoul. Now he works as director of Dawid Corporation.